I still bake, constantly, but I don’t have the same verve for blogging I had in the past. My time is filled with writing for clients, which requires more focus and a targeted list of goals that I try to hit, rather than the freedom of blogging in your own voice from a particularly personal place. Both fulfill certain aspects of my personality, and I’m thankful to have the two. Combing through some old work I found this recipe, which I’d created for Chef Dennis of Ask Chef Dennis, a fellow member of a recipe swap I was part of a long, long time ago. I recalled his simple, tentative blog flourishing into a side career for him that’s incredibly beneficial to the many he mentors, and his recipes becoming more specific and his stories more profound. I recalled this winter night I played with a desktop studio set and the new flash I’d recently purchased, playing with artificial light for a few months until I decided that natural light was the only way I’d go in the future. Dennis has asked me to guest post on his site, and for it I developed a recipe that represented what I was playing with at the time: small batches of sweets made with seasonal ingredients and a slightly exotic flair. The result was a bright lemon cake that’s buttery and rich but has a soft chew. It’s an easy recipe for someone in the early stages of gluten-free baking, as it has only three flours that are a strong base for a gluten-free cake flour blend (brown rice, tapioca and millet). 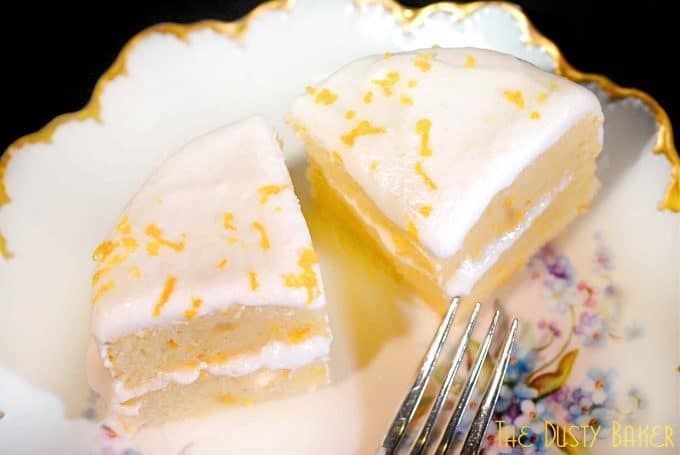 If, like me, your delight in desserts comes more from cake than frosting, you can simply brush this cake with lemon juice, melted jam or Limoncello liqueur and sprinkle it with ground nuts or fresh fruit. Or, if you’ve got more of a sweet-tooth, whip up the frosting to spread on top; it’s smooth and chills well, so you can serve the masterpiece later without worry. Preheat oven to 350°. Lightly grease cake pans and set on a baking sheet. Combine the flours, gum and baking powder in a small bowl and sift twice. Place a small pot of water on to simmer. In a bowl that will fit on top of the simmering water, whisk eggs, sugar and salt. When the water begins to simmer, turn off heat and put egg mixture on top. Whisk until just slightly warm, about 10-15 seconds (do not cook egg). Pour mixture into bowl of standing mixer fit with whisk attachment and beat until it triples in size and becomes light and creamy, about 4 minutes (or beat by hand on high speed). Fold in sifted flour mixture. Add lemon juice to butter and fold in. Pour equally into pans and bake for 18 minutes or until springy to the touch. Allow to cool for 5 minutes before removing from pans and inverting onto cooling rack. Add sugar and coconut milk, alternating wet with dry, and beating thoroughly in between. Slowly add lemon juice and ½ zest and beat to combine. Continue beating until light and fluffy. If desired, chill before frosting to thicken a bit. Layer frosting between cakes and decorate with remaining zest and unsweetened coconut chips.